For connections to non-fusion parts of the system, we offer flange connection, transition and saddle thread fittings, screw nuts and PEX adapters. The PESTAN Company is in an ecologically preserved environment with the production facilities on the banks of the Pestan River, after which the company was named. While producing environmentally friendly piping systems, we adhere to the requirements of ISO 14001, not only the base of our business planning and development but also the base of an effective environmental management system we have designed and implemented. Bringing the highest quality product and service has been a prime concern and pride of PESTAN, confirmed by ISO 9001 certification. Quality control begins at the production facility of the raw material suppliers and continues at our internal laboratory and test facility and ends with an independent third party accredited laboratories. Furthermore, these quality standards and compliances are annually confirmed by regulatory code organizations such as ICC-ES, IAMPO, MPA, TUV, DVGW and others. 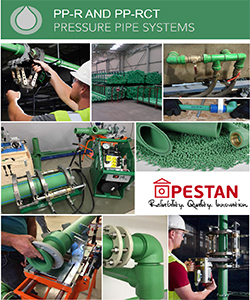 PESTAN PP-R and PP-RCT piping system use most advanced joint connection (heat fusion) and are made with most advances material piping system, so PESTAN is confident to warrant its products for 10 years.